1:1 iPad initiative in school has provided teachers and students more teaching and learning tools than ever before. Teachers start to see how mobile devices can support instruction and learning in a classroom environment. While iPad is an impressive stand-alone learning device, you may want to share your iPad screen using big projector so your students can see what’s going on. One solution for iPad mirror is to purchase an Apple VGA adapter that connects your projector and the iPad Apple port. Another choice, which works for the classroom and can also be used more collaboratively than any other, is the Apple TV. Apple TV (£99.00) is a little black box build by Apple largely for entertaining purposes and has been used increasingly in the classroom by teachers primarily for the mirroring capabilities. You can connect Apple TV to your HDTV with a single HDMI cable (£15.00). It is also possible to connect a projector with HDMI input to your Apple TV. After connecting the Apple TV to the existing Wi-Fi network, turn on the AirPlay in Apple TV Settings. 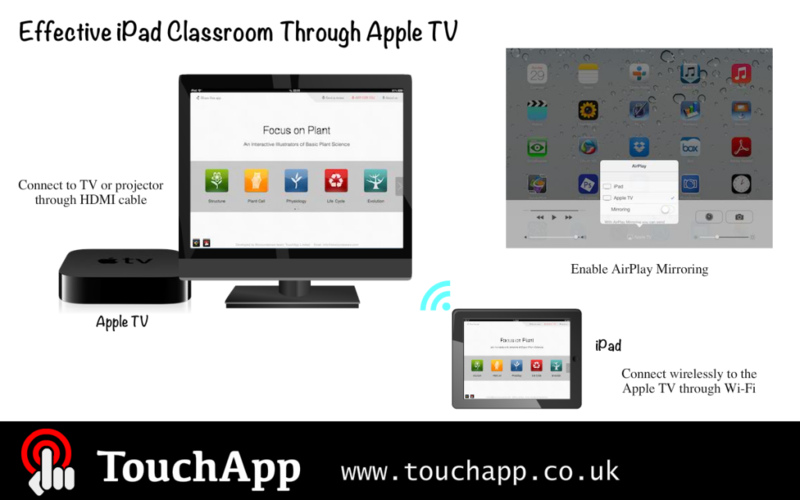 To enable your iOS devices (iPad or iPhone) AirPlay Mirroring, the devices need to be connected to the same Wi-Fi network as the Apple TV. To connect your iOS7 device, swipe up from the bottom of your screen to access Control Panel and tap the AirPlay icon (it will only appear if there’s an AirPlay device in range). Select the Apple TV you wish to connect and enable Mirroring, then your iOS device’s screen will be mirrored on your Apple TV. Though Apple TV, you not only can stream image of the iPad but also pass on the audio. There are obvious advantages using the Apple TV with iPad in schools. Teachers not longer need to be at the front of the classroom in order to share content with students as traditional interactive white boards. Presenting directly from the iPad allows instructors to move around the classroom and increased interaction with the students. Students can also easily share their work remotely through the Apple TV without physically connecting and disconnecting their iPad. All apple TV users in the classroom can present from their preferable locations to share with the rest of the class. Apple TV offers a cost-effective solution to create a dynamic and highly interactive iPad classroom.